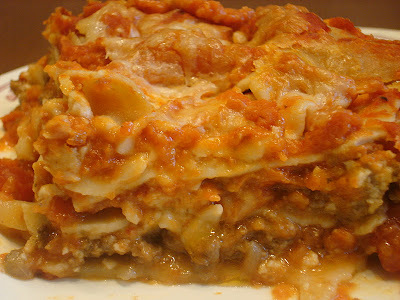 I make this easy lasagna quite regularly at my house. Aside from the time it needs to bake, the preparation is quite quick and simple, even when I make my own sauce from scratch. Also, if you don't have the dairy restrictions that we have at our house, feel free to use a stronger cheese, like Asiago, and add Parmesan cheese to each layer. 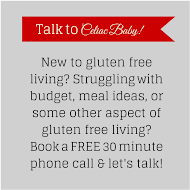 No one will know this is gluten free! 1- Cook the ground beef in a skillet, seasoning with dried basil and salt and pepper. Once cooked through, drain the beef and return to skillet. 2- Heat the tomato sauce in a small pan, adjusting the seasonings to taste. Puree the sauce with an immersion blender. A thin sauce is more likely to separate, leaving your lasagna watery. ***Using tomato puree instead of a bottled sauce removes the need for this step. Add some chopped garlic, basil and salt and pepper to create a sauce. Add 1/3 of the ground beef to sauce, stirring to incorporate it. 3- Ladle a layer of sauce on the bottom of your lasagna dish or roasting pan. There must always be sauce touching one side of the noodles. 4- On top of the sauce, layer lasagna noodles, trying not to overlap. 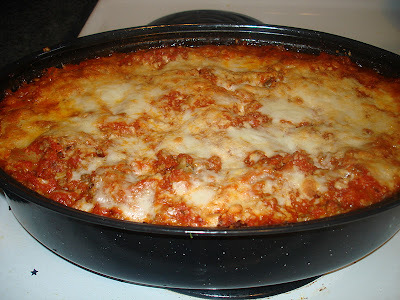 Top with a layer of ground beef, 1/3 of the cheese, and more sauce. Continue layering noodles, beef, cheese and sauce, laying the noodles in the opposite direction each layer, until you reach the top. Break noodles so they fit when layering horizontally. This helps the lasagna to stay together when serving. I do three layers of noodles, and finish with the ground beef and cheese on top. 5- Place lasagna in a preheated oven, covered, for 30 min. Uncover and cook for another 15 minutes, until the cheese is bubbling and beginning to brown. Remove from oven and let stand for 15 minutes before slicing. Serves 6- 8 with a side dish. If you are serving fewer, freeze the leftovers in single serving portions, and just defrost and reheat as needed.